Peter van der Veen augmented a study by Gabriel Barkay on the Egyptian pharaohs’ rule over Bronze Age Jerusalem, uncovering Egyptian statues, architectural elements and texts attesting to their presence in the city. This 13th-century B.C.E. red granite statue depicts an Egyptian queen. The Egyptian statue’s significance went unnoticed for quite some time; uncovered by Arab workmen during the British Mandate, it was brought to a local clergyman’s house before being kept in a scholar’s office in Germany. Credit: R. Müller, Department of Prehistory, University of Mainz. What were Egyptian pharaohs doing in Bronze Age Jerusalem? In a BAR feature thirteen years ago,1 Israeli archaeologist Gabriel Barkay investigated evidence of an Egyptian temple in Jerusalem, exposing the “Egyptianizing” of Bronze Age Jerusalem. 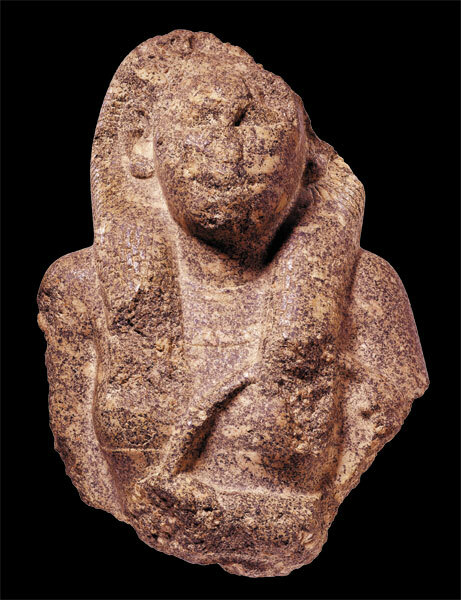 In the March/April 2013 issue, Peter van der Veen presents new evidence of an Egyptian presence in Bronze Age Jerusalem before David made the city the Israelite capital. In “When Pharaohs Ruled Jerusalem,” Peter van der Veen brings together an array of evidence—including Egyptian statues, stylized architecture and material culture—that points to their presence in the city. But what did the Egyptian pharaohs want with Late Bronze Age Jerusalem? And where were they when David conquered the Jebusite city? The initial study by Gabriel Barkay (which Peter van der Veen refers to as “reminiscent of nothing so much as Sherlock Holmes”) exposed Egyptianizing column capitals, a hieroglyphic stela and two Egyptian-style alabaster vessels that likely served as burial gifts. Peter van der Veen expanded the investigations of Gabriel Barkay to include figurines and Egyptian statues as well as a funerary stela referring to the local “ruler” of Bronze Age Jerusalem. The Egyptian artifacts date to the thirteenth century B.C.E., during the 19th Egyptian Dynasty that included the reign of Ramesses II. Peter van der Veen writes “Egypt was not new to Canaan in the 19th dynasty … Canaan was in effect an Egyptian province during the 14th century B.C.E.” In the famous Amarna letters, Abdi-Heba, the puppet-king of Jerusalem, proclaims that “the king has placed his name in Jerusalem forever.” While Bronze Age Jerusalem was not situated on Canaanite trade routes, Peter van der Veen notes that it controlled north-south traffic between Hebron and Shechem, as well as east-west traffic from the Via Maris to the King’s Highway. The Egyptians established a garrison at Manahat, just two miles southwest of Bronze Age Jerusalem. Peter van der Veen poses the question: “Was David able to conquer Jerusalem (in about 1000 B.C.E.) because it was defended only by the Jebusites/Canaanites, without any Egyptian presence in the city?” . 1. Barkay, Gabriel. “What’s an Egyptian Temple Doing in Jerusalem?.” Biblical Archaeology Review, May/Jun 2000, 48-57, 67. 2. Levin, Yigal. “Did Pharaoh Sheshonq Attack Jerusalem?.” Biblical Archaeology Review, Jul/Aug 2012, 42-52, 66.